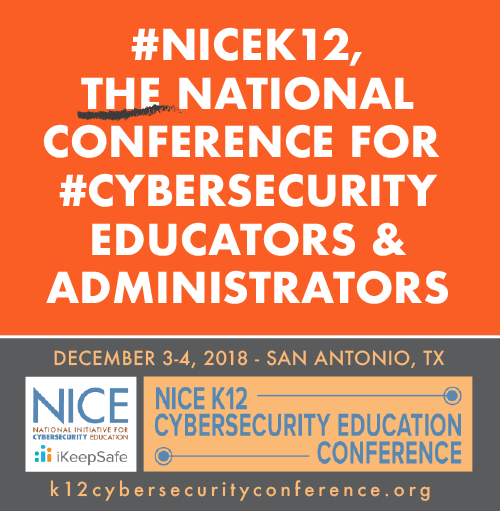 In order to make the 2018 NICE K12 Cybersecurity Education Conference a huge success, we need your help in spreading the word. 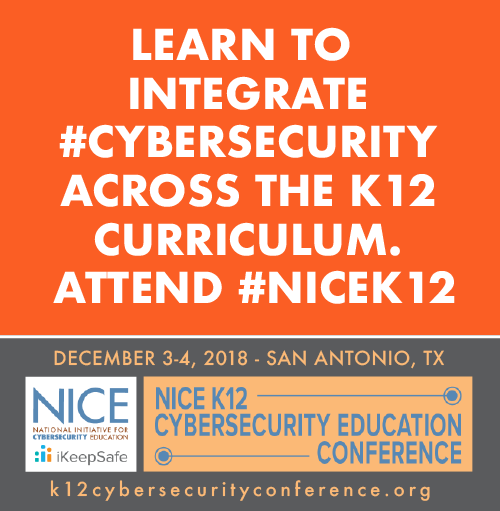 Join us at #NICEK12 Cybersecurity Education Conference in San Antonio on December 3-4, 2018, where we will collaborate to challenge and inform cybersecurity workforce, training and educational leaders from academia, business, and government. Registration is now open at https://www.k12cybersecurityconference.org/. See you there! We have developed sample emails for inviting potential sponsors, exhibitors, personal invitation to attend, and a registration announcement. CLICK THE BUTTON BELOW TO DOWNLOAD THE SAMPLE EMAILS DOCUMENT. THEN COPY/PASTE AND EDIT FOR YOUR AUDIENCES. Use the flyer on the left to promote the Conference at your school, send to your contacts, or share on social media. CLICK THE BUTTON BELOW TO DOWNLOAD AN 8.5"X11" PDF VERSION OF THIS FLYER.